So you fancy an upgrade for your bike? What’s it going to be? New wheels, new groupset, saddle, even tyres. It’s unlikely to be a seatpost. Of course from time to time you have a need, in my case the saddle clamp on the old one wasn’t holding in position anymore; it kept slipping, leaving me mid-ride with a saddle pointing it’s nose to the sky. Hence a little research, a bit of shopping around for the best price and finally an order placed for the Fizik Cyrano R5 Seatpost. Fizik are famed for their saddles. It’s only in the last couple of years that they’ve branched out into seatposts, stems and bars. And only this year that they’ve brought their range down to the low-end sort of price range that I can justify buying. I shied away from the top of the range £189.99 ‘Cyrano 00’ carbon version for this much more reasonable £39.99 ‘R5’ option. Sure there are still cheaper seatposts out there and you can go to a high street shop and buy an entire bike for around £100 but there is always an ideal position located somewhere between best product and best price, where you’ll find great value for money for what you want. 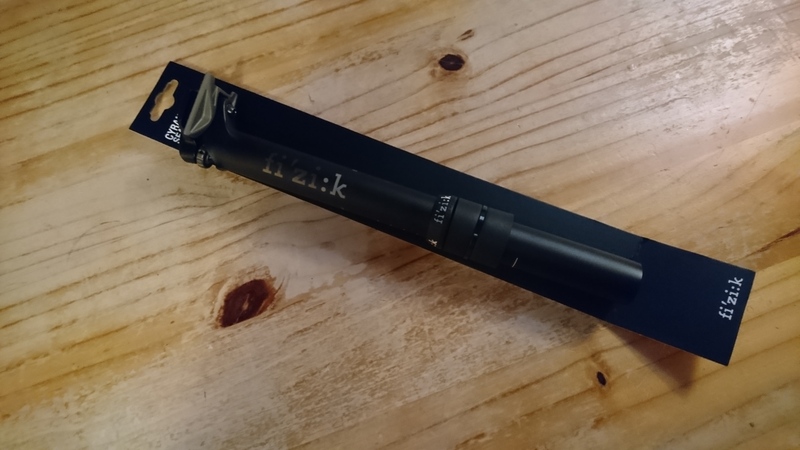 What I wanted was something lighter than what I already had, with a clamping mechanism that looked like it’d work well and be suitably adjustable, something that looked the part, in keeping with my frameset and as already mentioned not too expensive. For me the R5 hits those targets. It’s aluminium not carbon so it’s not super light but it’s probably one of the lightest non-carbon options out there and it doesn’t give you the comfortable ride that carbon apparently does but you pay a lot more for carbon components. One of the features that drew my attention was the clamp adjustment. Instead of the common two bolt arrangement with a bolt each at the front and rear, this clamp has a bolt at the rear and an adjustment ‘wheel’ at the front. The adjustment wheel is effectively a captured bolt but with a thumb wheel to adjust it. 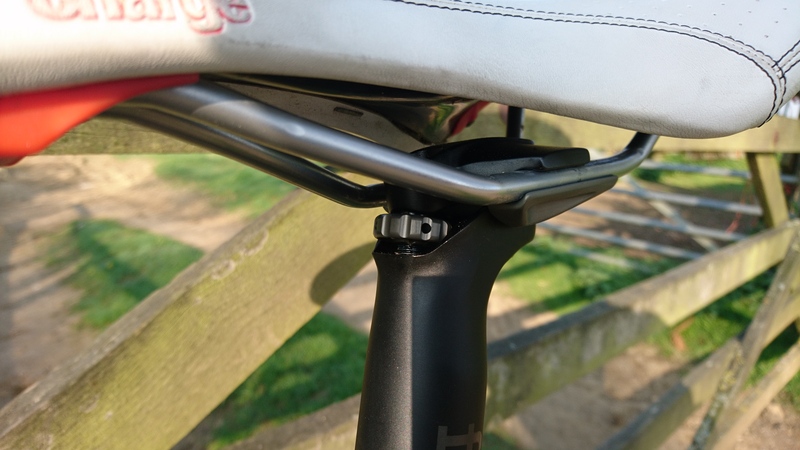 So you need to undo both the bolt and the thumb wheel ‘bolt’ to fit the saddle rails into the clamp, then you adjust the angle of the saddle using the thumb wheel and finally tighten up with the bolt. The only slight issue is that tightening the final bolt up causes the saddle angle to change slightly (nose up) so you will probably find yourself loosening it, readjusting and then re-tightening a few times to get the perfect position. Other features of the seatpost include the ‘ruler’ markings that help you get it back in the same position each time you remove and refit the seatpost into your frame. These weren’t apparent in the photos on Wiggle and I assumed that you only got this on the next model up but that isn’t the case. For me though, I’m right at the top of the markings where I clamp my post, so you can’t see them in the photos really; the markings are on the front of the seatpost. 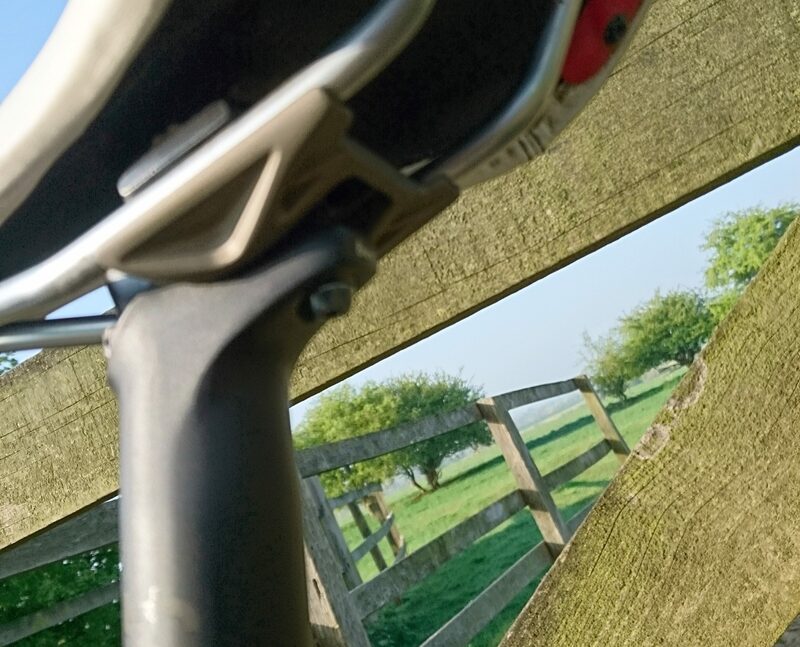 Additionally you get a rubber sleeve with this post that you can slide down after fitting the post into your frame, this provides a nice weather cover to help prevent water ingress into the seatpost/frame connection. Many riders very rarely remove their seatpost and then find when they do it’s corroded and got stuck, this cover should make this much less likely. It also looks good, as a nice finishing touch! While I’m talking about aesthetics, I must say as far as seatposts go, I’d say this one looks the part too. Certainly the matt black finish goes well with my bike’s frame and I like the recognisable but relatively discrete branding, no bright colours or anything too brash. So all in all, I’m very happy with my choice. I’ve now done several rides including a couple of longer ones and nothing’s slipped. I’ve not noticed any difference in road vibration but then that wasn’t expected, replacing an aluminium post with another aluminium post. Time will tell as to how long it maintains a good ‘look’ and whether the matt finish scratches off easily or not but so far overall I’m very pleased with it. Quite fancy the matching stem now! Just haven’t got a need to replace my stem though.